While it is possible to perform virtually any false deal with virtually any type of card, certain cards offer greater advantages over others. Generally, false deals are more deceptive when you use borderless cards, and I would recommend that while you practice with bordered cards, you use borderless cards in performances, or more importantly, in games. I recall the first time I used borderless cards. Over the past couple months I had been practicing false dealing, mostly seconds, with bicycle cards and had developed quite an effective deal, particularly when it came to push-off seconds. It was then that some neighbors invited me to a party, and after a short period, a deck of borderless, poker-sized cards came out to play an assortment of games from some traditional drinking games to mock poker. I began false dealing almost immediately, not out of any particular advantage it offered me, but simply because I found it more enjoyable than dealing straight and because I was curious if anyone would pick up on it, they didn't. Eventually, in mock poker I proceeded to cull winning hands and bottom deal them, but that is another story for another time. What I found myself marveling at that evening, both while playing, and while handling the deck privately, was just how much easier it was to second deal with this borderless deck, how I could fool myself effortlessly, particularly when it came to strike seconds. Please note, at this tenure, that when I say "borderless cards", I am not simply referring to cards that have no fixed border around the edges, but cards without any picture or inconsistent design on the backs. Generally, I've seen them in the form of cards with a sort of plaid back, or patterned simply by interlocking diamonds. Regardless, the point is that if two cards overlap, the patterns blend so that no contrasting edge is visible. Even casino cards that frequently have this pattern are not ideal as they generally have the name of the casino printed in the middle and thus are only good until you reach that design. The common brand are called "Bee Club Specials". This rule of using borderless cards is however only applicable so long as you are performing from a gambling standpoint, that is to say, with the cards face down. 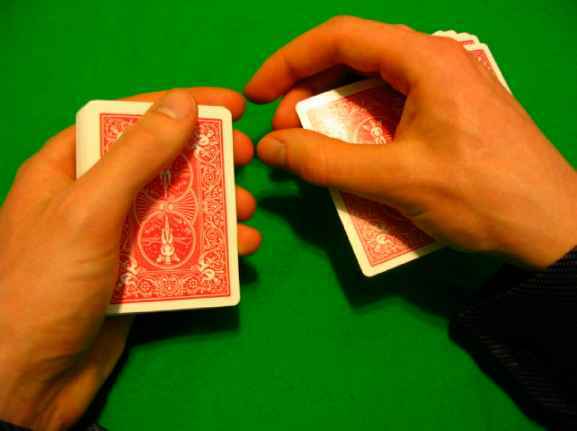 There are times when a magician may turn the top card face up and deal seconds, or some other false deal, perhaps using the deal as an apparent color change. In this case, borderless cards are undesirable, as the white of the faces contrasts with the edges of the backs, and thus cards with white borders are preferable. Then there is the consideration of card size. Yes, poker sized cards are used most frequently. However, we discussed economy of motion earlier in this portion of the book and it is a simple fact that when dealing off the side of the deck, you get much better economy of motion out of bridge sized cards than poker sized and thus, if you can get away with it, you may find you prefer to use bridge sized cards. This is true, especially in light of the fact that there are numerous other moves such as palming and some passes, where the move is easier to accomplish with the smaller cards. By contrast though, I find that for riffle culling and stacking poker-sized cards are better as they provide a superior bend, allowing for both better control, and easier peeking. mentioned using techniques such as the bottom palm Greek deal, where the bottom card is bent; here the regular cards are less desirable, as they tend to retain the bend, while plastic cards do not. Of course this is a trade off, as the inability of plastic cards to retain their bend makes them less effective for situations where crimps are necessary. This leaves plastic coated cards, which blend some of the advantages and disadvantages of both plastic cards and regular cards. Personally, I don't like them a lot; their feel is less than ideal. However, while there are moves that are virtually impossible to perform with plastic cards (I find plastic cards don't fan or spread well), these techniques are generally possible with plastic coated cards and yet these plastic coated cards possess greater durability than regular cards. Ultimately, it is a question largely of use; if you're tearing up cards frequently then you probably don't want to use the more expensive cards. If you're practicing a lot you might not want to go through dozens of decks practicing a single move and may benefit from plastic cards. Then again, you could be performing and mixing in a lot of flourishes, in which case plastic cards may not be suitable.